Five Mile is an ideal venue for a fairy tale beach wedding, right on the sea front and with a backdrop of a stunning mountain range. 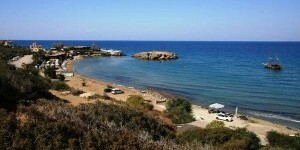 The clean water and warm temperatures make Yavuz Çıkarma, or Five Mile Beach one of Kyrenia’s top swimming beaches. The golden sandy beach curves round in a gentle bay, fringed with trees and protected by the foothills of the Kyrenia Mountains. Five Mile beach is located west of Kyrenia and is overlooked by the restaurant of the same name, which provides all the facilities you need. They can cater for luxury 3 course wedding breakfast for all your wedding guests, or just a cocktail party with canapés for your wedding reception, with a menu tailored to you.